Enjoy the soothing calm of a gently swaying porch swing while soaking in the incomparable view. A POLYWOOD® porch swing serves as an ideal setting for a casual afternoon nap or as the designated spot for story-time with the grandkids. 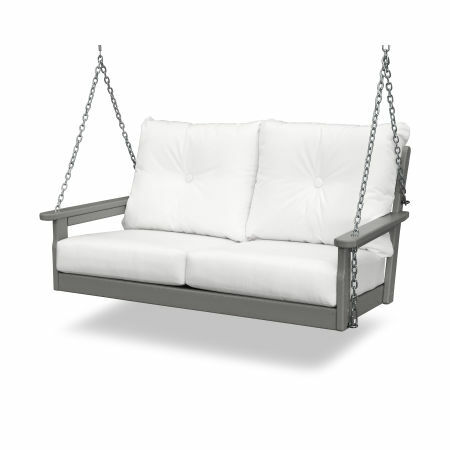 However you relax, do it in style with a POLYWOOD outdoor swing. The signature designs of our best-selling benches, Adirondack chairs, and deep seating sets have been updated to provide a smooth and luxurious swinging experience. The gentle contours of our lumber support your frame with ease, while the plush cushions of select swings deliver additional comfort. Each porch swing we manufacture is constructed with durable POLYWOOD® lumber to protect it from rotting, chipping, peeling, cracking, or splitting. HDPE lumber can withstand the harshest conditions without degrading, including torrential rain, consistent sun exposure, and biting coastal winds. Just as important as the lumber is the hardware used to affix your swing in place. We utilize marine-grade quality hardware that is weather and rust resistant to keep your swing completely safe and fun to use for years. Maintaining your porch swing is as simple as wiping it down with a mixture of warm water and mild soap when grime is visible. While porch swings are synonymous with your front porch, you can install an outdoor swing for your family in any outdoor area where there is a sufficient support structure. Add a focal point to your covered patio or expand the seating in your poolside cabana. Choose between Earth tones, neutral colors, and vibrant cushion hues to create the ultimate outdoor oasis. 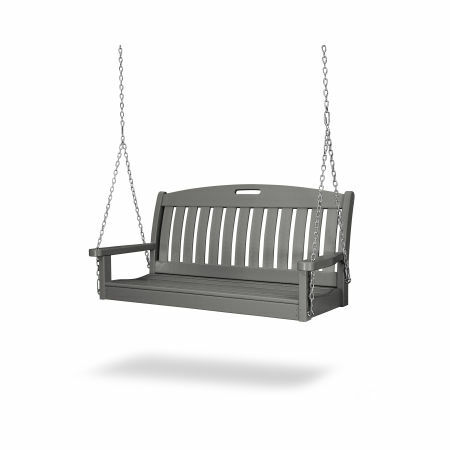 There are many factors to consider when buying an outdoor swing, like the amount of space you have for movement and how many people are likely to use it. To ensure you make the best purchase read our complete guide to buying an outdoor bench, swing, or glider.